In my mind, there are few staples of our nation’s culture more satisfying and archetypically American than the diner. You choose to eat at a diner or greasy spoon café and you’re rewarded with generous portions from a menu that is generally quite familiar. You sit amongst friendly, down-home type fellow customers, and when you’re finished filling yourself you gaze glossy-eyed and stuffed at greasy plate residue – the likes of which aren’t often seen outside of a bacon-filled frying pan. Usually, you disembark with a tab that’s alarmingly cheap. Quite simply, diners are almost always delicious, and there is an inherent cultural nostalgia in them that makes them very special tome. 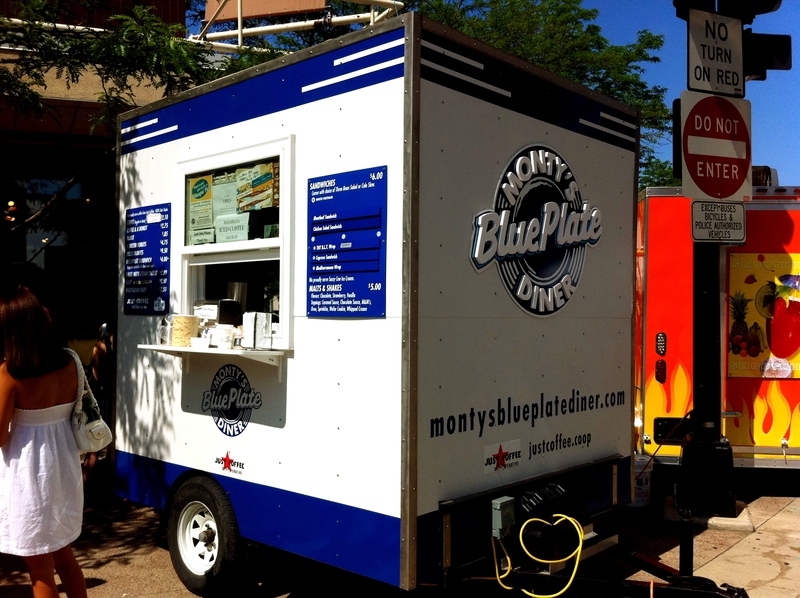 So you can imagine my excitement when the Food Fight Group opened a Monty’s Blue Plate Diner food cart which is alternately located at the top of State Street on the Square or on Library Mall. The menu is small, and focused around lunch sandwiches more than typical diner fare, but as I visited on a Farmers’ Market morning I opted for a hot coffee (a requisite diner beverage, 80+ degree weather or not) and a breakfast sandwich, which was vaguely described as featuring “cheese and apples.” While I waited for my intriguingly mysterious sandwich to be freshly prepared, I sipped my steaming cup of extraordinarily delicious and local Just Coffee Cooperative coffee. Five minutes later, I sat down with sandwich in hand. The total price came in at a pleasantly cheap $6.10, and a third of that was just for the coffee. 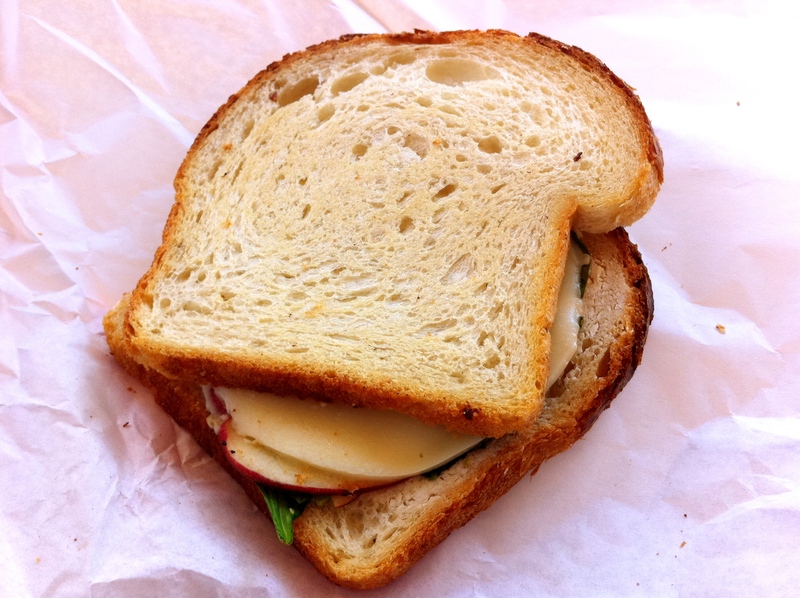 Experiences at countless diners had me presuming the sandwich to be egg-based, but what I was given instead was two enormous slices of toasted sourdough bread holding thin slices of tart apple with what appeared to be a large slice of provolone cheese atop fresh spinach, all smothered with a hidden layer of gooey, creamy, delicious cheese that I have assumed to be chèvre (Editor’s note: chèvre is goat cheese and when it is served hot, as it is on this sandwich, it is called chèvre chaud). The sandwich was decidedly unlike anything you would find in an actual diner, but you know what else? It was fantastic. So simple as to be humble, modestly proportioned, slightly crunchy, a little tangy and a little sweet, Monty’s breakfast sandwich left me perfectly satisfied with my brunch choice. My only complaint is that the fare from this cart is not well aligned with the “diner” aspect of the Atwood Avenue restaurant. Then, in the bottom of my little white paper take-out bag I noticed a donut. Whether this was included with the sandwich or a friendly gesture from the food cart maiden I cannot be sure, but it must be said that this hidden treat was a delightful surprise; sugary, sweet, light and still with a bit of crisp. None of that soggy old donut crap lesser establishments might pass your way. I walked away content, if not a bit too warm from all that coffee and humidity. I now find myself with a tantalizing curiosity about those other, non-breakfast sandwiches, diner name be damned. 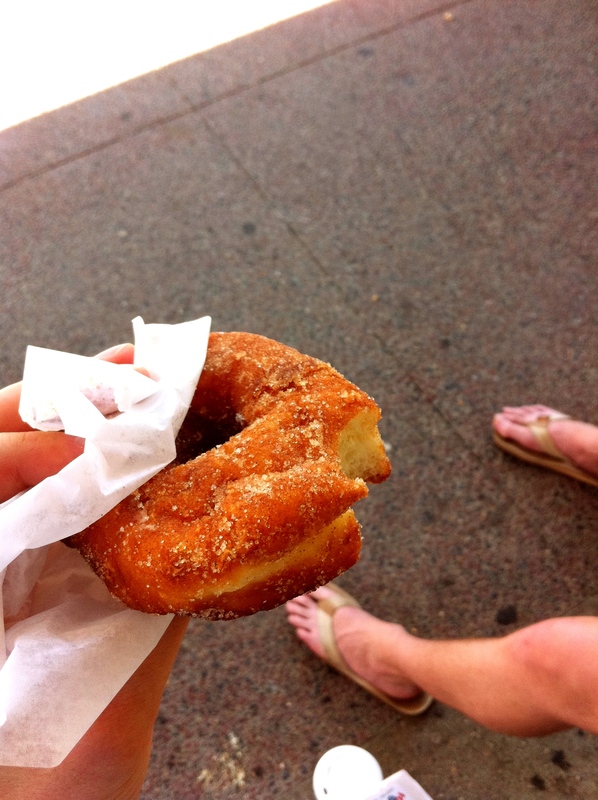 I believe that you have the option of receiving a donut when you order coffee at Monty’s for the low price of $2.75. That must be what they do all the time at the cart?